The rise of the culture of the Greeks from Homeric times culminating in the glory of golden age of Athens preceded the establishment of the Roman Empire. In this 3 to 4 week study the student will learn of the Trojan War along with the Greek and Persian wars and live into the birth of theater, the first Olympics, the inception of geometrical thinking and philosophy, as well as the tremendous Athenian achievements in architecture and statuary. The study concludes with the empire of Alexander the Great. From one of the listed sources (such as Herodotus), read or retell the section on the battle of Marathon. This battle took place with first invasion of Persia under the emperor Darius, and it is noteworthy because the Persians were repelled and returned to their homeland, but also because of the messenger who ran to Sparta for reinforcements, honored now by the long distance running events. Draw a picture of this first marathon runner. Review the rugged Greek terrain and then compose a story about what goes on in the runner’s mind as he dashes to Sparta. Describe his feet, his breath, his indomitable spirit, etc., moments of weakness and obstacles encountered. Draw a simple map of the lands surrounding the Aegean Sea. Label the following: Asia Minor (occupied by the Persian army), the Hellespont, Macedonia, Athens, and Sparta. Designate the location of Thermopylae and Salamis. Trace the route followed by Xerxes and his army along the coast of the Greek mainland. Recount the event where the Persian army crossed the sea by pontoon bridge at the Hellespont. Discuss what it would take to accomplish such a feat; livestock, supplies, wagons, and the entire army of two-and-a-half million would cross this bridge. Create a simple diagram that would show the process of construction in three or four stages. For instance, the diagram could show in stage 1 the stretching of rope across the channel; stage two might show the lashing of the boats together; stage three could show the laying down of planks from boat to boat, etc. Find from your source books examples of armor used by the Greeks or the Spartans and compare the merits of each. Draw a picture of an Athenian or Spartan warrior. If you can find some examples of Persian warriors of this period, include these as well. 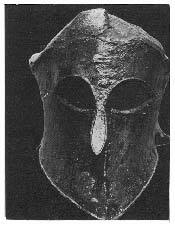 On the left is a Greek helmet that is similar to those used at the Battle of Thermopylae. Notice the dent at the top where the broad side of a sword may have struck the warrior. 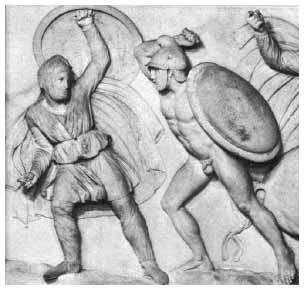 Note that in the picture on the next page of Greek and Persian warriors, the Greek warrior is unclothed. This was an artistic convention of the time to show the difference between Greeks and barbarians, but most often, the Greeks were clothed during battle. Discuss the difference between living under the rule of an absolute monarch such as the Persian king Darius or Xerxes, and life within a free city-state such as Athens. What freedoms did an Athenian enjoy that were unknown to a Persian in the army of Xerxes? What were the risks of being a free city-state? Have your student write down reasons why he would prefer one to the other. The land of Greece including map drawing, locating major mountains, seas, and islands such as Olympus, the Aegean, and Peloponnesus; locating major cultural/ historical sites such as Athens, Sparta, Delphi, Samos, Troy, etc. ; descriptions of the terrain and climate, and foods that are raised such as olives, grapes, goats, etc. The Birth of Thinking: Thales, Heraclitus, Pythagoras; geometry, speculation on the cosmos and nature, etc. Approximately 600 B.C. The Greek and Persian Wars 492-479 B.C. The Golden Age of Greece 480-399 B.C.